Students learning about the ABO blood group system commonly get confused about two unique situations: The Acquired B phenotype and the Bombay phenotype. These two entities are VERY different, but they are similar in this way: people are asked about both on exams all the time, but hardly anyone every actually SEES either one in real life! It is essential for students of blood banking to understand Acquired B clearly, as it remains a real possibility in everyday practice. I’ll cover Acquired B in this month’s blog, and next month I will discuss Bombay. Routine ABO testing is performed in two distinct (but usually simultaneous) stages, known as “red cell grouping” (forward grouping or “front type”) and “serum grouping” (reverse grouping or “back type”). Here’s an example of how it works: If a person’s red blood cells (RBCs) react strongly with reagent anti-A but not anti-B, we would interpret their red cell grouping as blood group A. If there is no ABO discrepancy, that same person’s serum should have no reaction with reagent group A1 RBCs and strong reaction with reagent group B RBCs (demonstrating the expected presence of anti-B in the serum). Thus, the serum grouping interpretation would also be blood group A, and no ABO discrepancy would exist (see this illustrated in the figure below). ABO discrepancies occur any time the interpretations of a person’s red cell and serum grouping do not agree. ABO discrepancy takes on many forms, and acquired B is a great, if not terribly common, example. 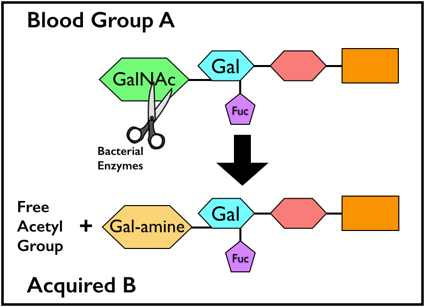 Usually, Acquired B occurs when the RBCs from a blood group A patient come in contact with bacterial enzymes known as “deacetylases.” These enzymes, commonly carried by bacteria that live in the colon, catalyze the removal of the acetyl group from the residue that gives the A antigen its specificity, N-acetylgalactosamine (GalNAc). This modification leaves the A-specific sugar as galactosamine (N-acetylgalactosamine with the acetyl group removed = galactosamine). Recall that normally, the group B-specific sugar is galactose. As a result of this modification, anti-B in both human group A serum and especially certain monoclonal reagents will weakly agglutinate the group A RBCs carrying the acquired B antigen. This means that the patient’s RBCs may have a weakly positive reaction with anti-B in serum grouping tests instead of the expected negative (see image below). The serum grouping for these patients is no different from that expected for a group A individual (negative with group A reagent RBCs, strong positive with group B RBCs). So, what does this actually mean? How do these patients actually get transfused? This is where the recognition of the entity in a transfusion service or reference laboratory is essential. Several simple strategies can be employed to prove that this patient is really NOT group AB. First, I always advise people to check the patient history! The rare cases of acquired B that are still seen will often be associated with colorectal malignancy, gastrointestinal obstruction, or gram-negative sepsis (where those bacteria can contact the RBCs). Second, adding the patient’s own serum to his RBCs (autoincubation) reveals no incompatibility. In other words, this patient’s own very strong anti-B does not recognize the acquired B antigen (which is really just a partially modified group A antigen) as being an actual group B antigen. We already know that this patient has anti-B in his serum from his serum grouping results (see above), but the patient’s own anti-B completely ignores the acquired B antigen on his RBCs (even though human anti-B from other people will react). Third, the technologist can use a different form of monoclonal anti-B in the patient’s red cell grouping test. Certain clones are known to react with acquired B, while others are not (normally specified in the package insert), and choosing a different clone (often easier in reference lab settings) will render the forward grouping consistent with that of a group A person. Also, incubating the Acquired B RBCs with acetic anhydride will lead to “re-acetylation” of the modified A antigen and loss of the B-like activity. Finally, acidifying the reaction mixture of the patient’s RBCs with human anti-B (non-self) can eliminate the incompatibility with that source of anti-B. In the end, Acquired B is a serologic problem that is fairly easy to recognize, especially on examinations (I always tell my students that when they see a problem that starts with words like, “A 73 year old male with colon cancer…”, check the answer for Acquired B!). In real life, experienced blood bankers can diagnose and confirm Acquired B fairly easily in the rare times that it is seen. These patients can receive group A blood without a problem, and the ABO discrepancy will disappear as the infection or other situation causing causing contact with bacterial enzymes clears. Thanks for your time and attention. See you next month when I will discuss the Bombay Phenotype! For me as a layman, it was really interesting. It was easy enough to understand even without the links to the blood bank guy website (they no longer work and probably got broken in that website’s latest redesign). Thanks for the heads up regarding the links, AC.